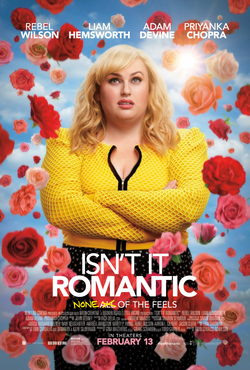 We’re introduced to a young architect Natalie (Rebel Wilson) who doesn’t see herself as worthy of a man. She’s jaded on relationships because as a child her mother taught her that romantic comedies are jokes and true love can’t be had (reminiscent of the premise of Trainwreck). She’s friends with co-worker Whitney (Betty Gilpin) who is a hopeless romantic and watches romantic comedies all day. Her other co-worker Josh (Adam Devine) keeps asking her to karaoke and happy hour but consistently demurs – not seeing Josh’s overtures as romantic. When Natalie is not taken seriously by very hot client Blake (Liam Hemsworth), she runs home. On the subway she is mugged and bumps into a girder, knocking her out. She wakes up in a hospital and realizes that everyone thinks she is beautiful and everything is coming up roses. Exiting the hospital, she runs into Blake – only now he finds her irresistible.